TI-Planet est géré par l'association UPECS. La collecte potentielle des données personnelles est déclarée à la CNIL au nom de l'association. - Google AdSense. Voir la politique de confidentialités de Google. - AdvertStream AdAccess. Voir la politique de confidentialités d'AdvertStream. Nous n'utilisons pas de fonctionnalités de tracking avancé de Google Analytics permettant de mieux vous identifier ("User-ID"). This privacy statement (“Privacy Statement”) applies to the treatment of personally identifiable information submitted by, or otherwise obtained from, you in connection with the associated application (“Application”). The Application is provided by TI-Planet (and may be provided by TI-Planet on behalf of a TI-Planet licensor or partner (“Application Partner”). By using or otherwise accessing the Application, you acknowledge that you accept the practices and policies outlined in this Privacy Statement. WHAT PERSONAL INFORMATION DOES TI-Planet COLLECT? We receive and store certain types of usage related information whenever you interact with Application. For example, TI-Planet may automatically receive and record information regarding your computer’s IP address, browser information, Facebook user ID, Facebook Page fan status, and URLs accessed. Such information may be shared in aggregate (non-personally identifiable) form with our partners. HOW DOES TI-Planet USE THE INFORMATION IT COLLECTS? TI-Planet uses the information described in this Privacy Statement (i) internally, to analyze, develop and improve its products and services, and (ii) as set forth below in the “Will TI-Planet Share any of the personal information it Collects” section below. WILL TI-Planet SHARE ANY OF THE PERSONAL INFORMATION IT RECEIVES? Agents: We employ other companies and people to perform tasks on our behalf and need to share your information with them to provide products or services to you. Unless we tell you differently, TI-Planet’s agents do not have any right to use personal information we share with them beyond what is necessary to assist us. You hereby consent to our sharing of personal information for the above purposes. Business Transfers: In some cases, we may choose to buy or sell assets. In these types of transactions, customer information is typically one of the business assets that are transferred. Moreover, if TI-Planet, or substantially all of its assets were acquired, or in the unlikely event that TI-Planet goes out of business or enters bankruptcy, user information would be one of the assets that is transferred or acquired by a third party. You acknowledge that such transfers may occur, and that any acquirer of TI-Planet may continue to use your personal information as set forth in this policy. Protection of TI-Planet and Others: We may release personal information when we believe in good faith that release is necessary to comply with the law; enforce or apply our conditions of use and other agreements; or protect the rights, property, or safety of TI-Planet, our employees, our users, or others. This includes exchanging information with other companies and organizations for fraud protection and credit risk reduction. The Application may permit you to link to other applications or websites. Such third party applications/websites are not under TI-Planet’s control, and such links do not constitute an endorsement by TI-Planet of those other applications/websites or the services offered through them. The privacy and security practices of such third party application/websites linked to the Application are not covered by this Privacy Statement, and TI-Planet is not responsible for the privacy or security practices or the content of such websites. TI-Planet allows you to access the following information about you for the purpose of viewing, and in certain situations, updating that information. This list may change in the event the Application changes. Our site and the services available through TI-Planet may not be all intended for children under the age of 13. TI-Planet does not knowingly or specifically collect information about children under the age of 13 and believes that children of any age should get their parents’ consent before giving out any personal information. We encourage you to participate in your child’s web experience. TI-Planet may amend this Privacy Statement from time to time. Use of information we collect now is subject to the Privacy Statement in effect at the time such information is used. If we make changes in the way we use personal information, we will notify you by posting an announcement on our Site or sending you an email. Users are bound by any changes to the Privacy Statement when he or she uses or otherwise accesses the Application after such changes have been first posted. 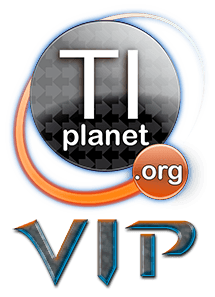 If you have any questions or concerns regarding privacy on our Website, please send us a detailed message at info[at]tiplanet[.]org . We will make every effort to resolve your concerns. En utilisant le site TI-Planet, vous consentez à l'utilisation des cookies. - personnaliser l'affichage (exemples : filtres des news en page d'accueil, choix de la version mobile/ordinateur...). Les cookies permettent donc à la fois un fonctionnement optimal de nombreuses fonctionnalités du site, et améliorent l'expérience de navigation sur le site selon vos paramètres.